Driven by his passion to take care of the people who willingly put their lives on the line, Medical Technology Enterprise Consortium’s COO, William Howell, talks to the Community Blog about the goals of MTEC, and cutting-edge biomedical research that has recently received funding through this US Army organization. Although research is primarily focused on restoring function to severely injured soldiers, many of the medical technologies originally developed by or with funding support from the US military are also impacting the lives of millions of civilian patients. If you’ve been following the Community Blog, you’ll know that our mission is to support the passionate global MedTech Strategist community, who collectively work to improve world health. And, in this author’s view, the development of cutting-edge critical care medical technologies for our soldiers who are injured in action—and helping them recover once they’re home—is among the most admirable work that is being done in the medtech space. Spc. 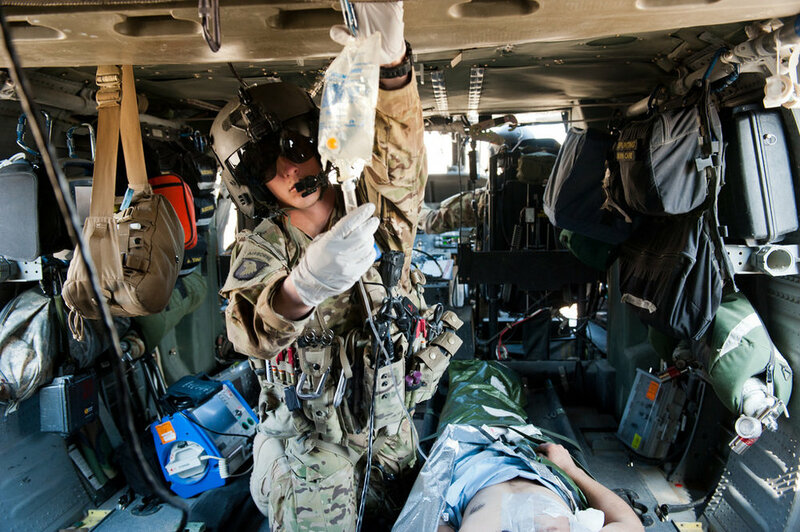 Thomas Appelhanz, C Company, 6th Battalion, 101st Combat Aviation Brigade flight medic checks to ensure IV fluid is flowing properly to a wounded Afghan National Army Soldier during a patient transfer mission at Forward Operating Base Tagab, Kapisa province, Afghanistan, 11/5/12. U.S. Army photo by Sgt. Duncan Brennan. First, a comment on how far we’ve come in terms of military medicine: Thanks to a remarkable array of advanced trauma care technologies developed by the US military—particularly during the past two decades of nearly constant conflicts overseas—soldiers today have the best survival rates in the history of warfare, at around 92%, according to various sources. This compares to 75% or lower in the Vietnam War and other conflicts. In fact, this improvement deserves to be recognized as one of the most remarkable achievements in the history of US medicine, according to a July 2018 post on the Health Affairs blog. In this post, we discuss the commendable work being done by Medical Technology Enterprise Consortium (MTEC) to support these goals. MTEC, established through US Army funding in 2015, is a non-profit, 501(c)(3) biomedical technology consortium collaborating under a ten-and-a-half-year Other Transaction Agreement (OTA) with the US Army Medical Research and Materiel Command (USAMRMC) and the US Department of Defense (DoD). Its purpose is to facilitate research in and translation of life sciences technologies, across many areas of combat casualty care and other related medical threat areas exposed to the military upon deployment. The OTA is a special funding vehicle used by federal agencies to facilitate mutually beneficial R&D collaborations between industry, academia and the government. Importantly as well, many of the medical technologies originally developed by or with funding support from the US military are also impacting the lives of millions of civilian patients. The Community Blog spoke with MTEC’s chief operating officer, William Howell, a 35-year DoD retiree who, over the course of his career, has managed research projects for biologic, drug, and medical device product development. Among other achievements, he served in the $1+ billion US Army Deployable Medical Systems (DEPMEDS) program, which re-equipped all the hospitals that go to war, and he ran the first project that introduced electronic health records in the military battlefield. Howell is very passionate about his mission of taking care of the people who willingly put their lives on the line, he says. This mindset is also shared by the president and chairman of the board of MTEC, Lester Martinez Lopez, MD, Major General (Retired), US Army, and the rest of the MTEC team. At MTEC, Howell leads the organization’s technical product development activities. “This OTA consortium model allows for the collaboration of parties who maybe the government never would have known about or contracted with before, including medtech start-ups and nontraditional players,” says Howell. And importantly, according to Howell, about 90% of the research coming out of the military makes it to the civilian market. He gave the example of more than 20 years ago, he was on a military team that helped develop prototypes of the first digital imaging and archiving technology for IBM, technology that is now in most every hospital in the US and most of the world. Companies or researchers who are interesting in putting in a proposal with MTEC need to join the consortium first (this includes a $1,000 annual fee for small companies and non-profits, and a $5,000 annual fee for larger companies). Also MTEC gets a 1% assessment of any awards, and all these fees support MTEC, which is self-funded. Just in the last year, MTEC, in partnership with the USAMRMC, has awarded $46 million in funding to a number of cutting-edge biomedical research projects focused on restoring function to severely injured soldiers. These include: cellular therapy for the treatment of hemorrhagic shock, with approx. $2 million in funding awarded to the University of Texas Health Science Center at Houston, Athersys Inc., Memorial Hermann Hospital, and Red Duke Trauma Institute; and solutions for optic nerve injury, with $3 million in funding awarded to Byers Eye Institute at Stanford University, and Boston Children’s Hospital. Another project focuses on peripheral nerve injury repair and regeneration, as described below. “The long-term goal is to take all these disciplines we are researching, and apply them to, for example, a soldier who has lost the use of his arm below the elbow. Can we actually grow something that would be functional so that he wouldn’t need an amputation or prosthetic?” says Howell. In late December, Pittsburgh, PA-based peripheral nerve start-up company Renerva LLC received $2.4 million in nondilutive MTEC financing, which it will use to complete its preclinical program and begin human clinical trials. Renerva's peripheral nerve matrix (PNM) is an injectable gel derived from porcine tissue that promotes and supports repair and regeneration in injured peripheral nerves. PNM is a sterile, non-immunogenic solution that transforms into a supportive gel upon contact with the site of nerve injury. Renerva's initial focus is on the 500,000 Americans suffering from acute nerve injuries every year, with other indications including the treatment of chronic compressive nerve injuries and other conditions affecting the peripheral nerves. Another team that received $2.3 million from MTEC as part of this same peripheral nerve injury project is Wake Forest University Health Sciences in Winston-Salem, NC. This group’s pioneering work is focused on the treatment of extensive skeletal muscle loss due to traumatic injuries, congenital defects, or diseases such as cancer, which is a clinically challenging problem for soldiers and civilians alike. Using the MTEC award funding, the Wake Forest team plans to develop an implantable bioprinted engineered muscle prototype with pre-formed neuromuscular junctions and a neurotrophic factor controlled-release system to accelerate integration with host nerve. Stay tuned to the Community Blog for future posts that will further explore the impact of the military on the global medical device industry, and patient care. Are you a medical device executive with a military background or has your medical device company received funding from the Department of Defense or other military-related source? We want to hear from you! Please e-mail us at blog@medtechstrategist.com, and we may cover your company and personal story in an upcoming post on the Community Blog! We humbly thank you for your service.